So Shay: Heaven in my mouth. I've been on pinterest for a couple of months now and yes, I share my love for it with the other 193018401823 people in this world. I'm really bad at actually pinning things, but still go on it to get inspired, etc. etc. I am not a horrible cook, but I'm one of those cooks or bakers who sticks to the same thing over and over. Last night I got the biggest compiment of my life from my hubs. "This is the best thing you've ever made." Sadly, I can't say it's some random recipe that I made up, or that I miraculously found. It's a peach cobbler recipe I found on Pinterest. It's made by Paula Dean. You know that lady makes some good shiz. Y'all we went to TOWN on this peach cobbler. I highly, HIGHLYYYY recommend you make it. Do it exactly like she says to or it won't be the same. I do get the worst blog award for not taking pictures of it last night but my kitchen was a MESS and dirty dishes were everywhere. That, and just pure laziness. Oh how I love peach cobbler... Yum yum yum!! I'll have to try this one! though i dont like pies/cobblers, i would eat this because you made it!! i LOVE peach cobbler! My grandma makes the BEST peach cobbler...I should try and jack her recipe and share it! i ..... need to be a better cook. actually, i just need to ATTEMPT to cook. or else, well stone will probably want to ditch me. but i like to reassure him i can clean. anyways, i am printing this out. and will put it with the rest of the recipes i want/need to make. and i need to follow you on pinterest. which in fact, i was explaining to a random women at the Halloween store today on my lunch break. and then got embarrassed when the other lady listening corrected me for saying the name wrong. whatEVER i like pin-interest better. Paula Deen knows her shizzz when it comes to the kitchen. She's doing a book signing in my college town and I don't care if it takes skipping class, I'm meeting that woman. YUM!!! I love me some peach cobbler!!! Pinterest is so addicting!!!! this looks sooo yummy!! That looks delish! What did we do before Pinterest was around!!! That cobbler looks amazing.. Pinterest is addicting, love everything about it. This looks amazing! I love Paula Deen recipes! umm, sounds very amazeballs. And easy enough that I may actually try making it. Thanks for sharing gurrrrlll. Peach Cobbler is my favorite dessert! I'm pinning & going to make this. It looks DELICIOUS!!! 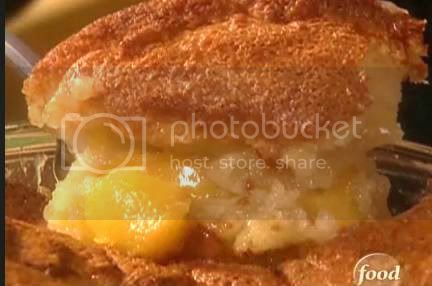 I love peach cobbler, I'm so trying this recipe!!! um, it LOOKS amazeballs :) I love peach cobbler. And his awesome compliment.